Much of this comes from the comments in the MAME emulator. The CPU's INT line is asserted via a D flip-flop at E3. The flip-flop is clocked by the expression (! (64V | !128V) | VBLANK). sync chain is 0x80 and 0xda and VBLANK is 0 and 1, respectively. These correspond to lines 96 and 224 as displayed. 0xc7 | (64V << 4) | (!64V << 3), giving 0xcf and 0xd7 for the vectors. one of its memory access control signals. The value CF is RST 8 and D7 is RST 10. If I understand this right then the system gets RST 8 when the beam is *near* the middle of the screen and RST 10 when it is at the end (start of VBLANK). The raster resolution is 256x224 at 60Hz. The monitor is rotated in the cabinet 90 degrees counter-clockwise. The screens pixels are on/off (1 bit each). 256*224/8 = 7168 (7K) bytes. Port 07 is also demultiplexed. The schematics say the select signal is wired directly to input-port-0's bit 7. This doesn't make sense. The 8080 instruction set does not include opcodes for shifting. An 8-bit pixel image must be shifted into a 16-bit word for the desired bit-position on the screen. 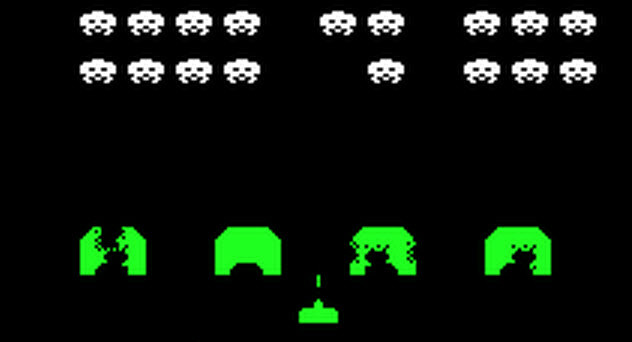 Space Invaders adds a hardware shift register to help with the math. Writing to port 4 shifts x into y, and the new value into x, eg. write $12 -> $12ff, .. Writing to port 2 (bits 0,1,2) sets the offset for the 8 bit result, eg. Reading from port 3 returns said result. bit 7 ? tied to demux port 7 ? 2400 - 3FFF (1C00 bytes = 256 * 28) 28*8=224. Screen is 256x224 pixels. The map below shows the raster layout. Take this map and rotate it counter clockwise once. Thus the first byte is lower left. First "row" ends upper left. Last byte is upper right.